One of our major responsibilities as scientists and technologists is to lead the world to the state of richness in health and technology. We, therefore, dedicate our lives and souls for deep researches in such areas of our own interest. 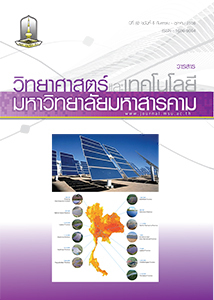 Publishing our research knowledge in the journal is one way to convey our knowledge to the world, so preparing this issue of journal of Science and Technology Mahasarakham University is one of our main tasks. The applications of applied statistics-vit. environmental, hydrology, economics and other related areas, are also emphasized with the technique of data mining, copulas, quality control, optimal designs, optimization and sampling design. In addition, the application for health science and education such as the satisfactions level of outpatients by Jonckheere-Terpatra, the development of hot-deck corrected item mean (HDD-CIM) for estimating missing data and student retirement analysis, are also selected for journal in this issue. We do believe that this issue of our Journal of Science and Technology Mahasarakham University will serve as media of knowledge and to enhance the communication in this modern world of technology.